We really didn’t have a planned route. After leaving the store we just started exploring. Whenever we saw an interesting road we would take the turn. One of the first trails we took was kind of an overgrown two track trail. It was mostly easy terrain with the occasional moderate challenge. A couple of miles into the trail we actually came across a real estate sign! Seriously? I have never seen a real estate agent willing to take you off road to see a grown up piece of property, but there it was. I got this funny picture of me and my real estate agent, in a suit, loaded up on a 4-wheeler riding up through the woods to see this place. When the trail came to a dead end we took a break and headed back to explore some more. The day was starting to heat up a bit so we decided to take the Blue Ridge Parkway to get into some higher elevations. We turned onto a road that headed up to Black Balsam off the parkway. A few minutes later there was a lady waving her arms. Stretch thought she was just saying hello so he waved and kept rolling. It looked like a distress wave to me so I stopped. She had lost her keys and needed to call for help, but there was no cell coverage to make a call. We told the lady we would let the rangers know as soon as we find a station. We finally found a ranger several miles up the road so we stopped and let him know. Stretch and I became the first two Good Samaritans. Keep this in mind. It’s important later. We headed up the parkway to Asheville, NC. It was time to refuel the bikes and our stomachs. During lunch I had been telling Stretch about some of the restaurants in downtown Asheville. After we got gas he asked if I wanted to lead since it sounded like I knew something about Asheville. Anybody who has ever been with me on the road knows that I am horrible with directions. I just laughed, pointed to a mountain in the distance, and said it looks like there’s a mountain that way. If I am not using a GPS and I am not near home, I am lost. You can count on it! A little way outside Asheville we hit some more trails. We came across a snake that looked like he had just eaten. As we past by he didn't even consider moving. There was actually a lot of wildlife on this ride. There were two snakes, deer bouncing around in the dark, a bunch or turkeys, and one suicidal ground hog. The ground hog took off in front of Stretch as he passed. Luckily, Stretch was able to slow down enough to let him by. This ride took us to some of the most difficult terrain we have ridden so far. It wasn't all hard, but I was definitely challenged a few times. I believe I dropped my bike about 5 or 6 times. For one of the hill climbs I was in the lead. I just twisted back and kept my feet out. I probably looked like a crazed maniac the way I was riding, but I made it to the top without falling! I think Stretch was equally surprised when he made it too. The hill climb was a bit of a rut filled with large rocks that roll out from under you. At the top of the hill was an intersection of trails. We went left and ended up running through the bed of a spring all the way down. I dropped my bike three times trying to get through that. I didn't get hurt, but it is hard work lifting that thing back up. On another section of trail we took a firebreak. The firebreak ran through a small valley that was very steep and filled with rocks. I lost my goggles from a tip over a few minutes earlier and Stretch found them at the bottom of the firebreak. As Stretch was climbing back out it was so steep his front wheel was coming off the ground. When he let off the throttle to settle the wheel he got stuck right at the top. All he could do is sit there until I got there to help prevent him from rolling back as he pulled the rest of the hill. 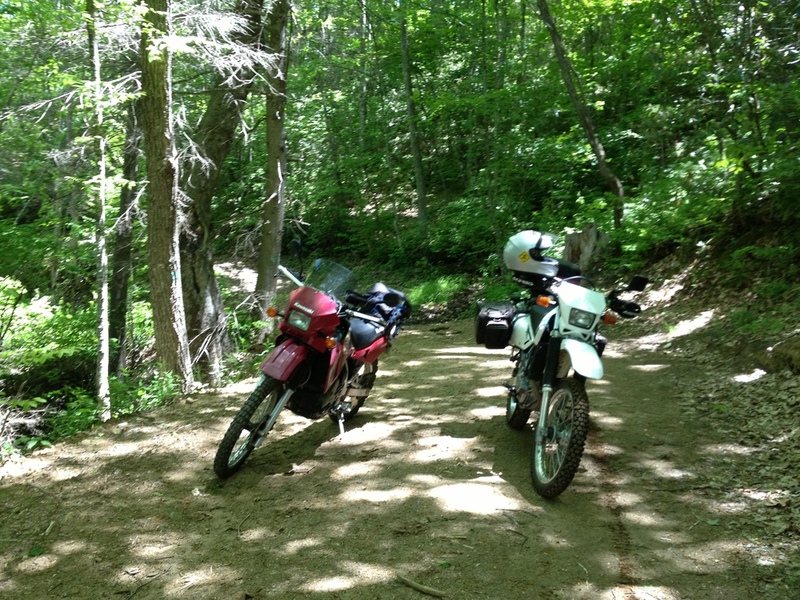 Teamwork is very important for dual sport rides. Spring time in the mountains is fantastic on a motorcycle. There were many places where the honeysuckles were so fragrant you could smell them going down the road. Not to mention they look really nice. As evening started approaching the smell of charcoal and campfires started filling the air as people were settling in for the night on the trails. One thing most riders know is how many characters you meet on your rides. We stopped at a little gas station somewhere in the mountains and took the time to eat a snack. There was an older guy in a doo rag sitting on the bench. We talked with him for a while about bikes and found out he had built his daughter a Harley bobber in 1972 and he still has it. Then there was a teenage boy that drove up in his jacked up Dodge truck with the loud exhaust. He got out of that truck looking as country as it gets. He had on a straw hat, no shirt, overalls, and bare feet. The teenager knew the old guy. The two of them sat on the bench and talked about guns for a while before the teenager drove off in a puff of diesel smoke with his exhaust screaming. Stretch and I rode for about 16 hours with a total trip time of 19 hours. After we came through Brevard, NC on the way back home my headlight went really bright and then a few minutes later it just went out. I figured my low beams just burned out so I flipped on my high beams. My high beams ran for about five minutes before it went really bright and went out. Now I am riding around at 10:45 at night with no headlight. We made an emergency stop. We pulled over in the perfect place. It was at an intersection with a church parking lot. There was no traffic coming past us, level ground, a street light, and a transformer box that made a perfect work bench. I started pulling the covers and seat off the bike to start troubleshooting. Just then, a guy in a BMW pulled up to ask if we needed any help. Stretch jokingly said, “Are you a motorcycle mechanic?”. To our surprise, the guy in the BMW said he was! We gladly accepted the help because at this point the problem still hadn't been diagnosed. The trail is pretty grown up. The guy in the BMW said he would come right back after dropping his wife off. By the time he got back, Stretch and I had figured out that the battery had gone bad and probably had in internal short. It was hot to the touch and steadily getting hotter. The guy in the BMW agreed to take me to Wal-Mart to get a battery and headlight bulb. During the car ride I learned that he works at the BMW Performance Center and he was one of the people that brought the motorcycle program over from Germany! We had a great conversation about adventure riding and the performance center. When we got back, we all worked together to get the battery and headlight bulb installed. This is also when we noticed that I had lost one of my sweet skull head tag screws and blown a fork seal. This little incident took us almost two hours to get over and I couldn't help but think that God hooked us up with some great help. It just reinforces my belief that there is a certain brotherhood and community between motorcycle riders no matter where you meet. The guy in the BMW would be our third Good Samaritan for this trip. If you are an adventure rider you need to know your bike well enough to work on it without a manual. I actually can complete a longer ride than I thought! 19 hours is a record for me. It used to be 11.5 hours. The previous record was also set with Stretch, but on street bikes. I can’t help but think that Stretch and I received help in our time of need because we tried to help someone else in their time of need. Needing help later didn't cross my mind when we were looking for a ranger station earlier in the day, we were just trying to help. When the guy in the BMW pulled up and offered us so much assistance, it hit me. What you reap is what you sow. With this realization it also begs the question, What do you sow? My First Dual Sport Ride!